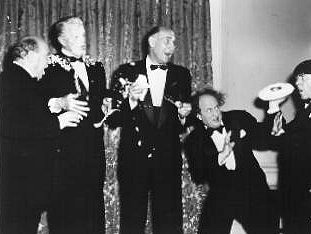 P ies and Guys starring the Three Stooges (Moe Howard, Larry Fine, Joe Besser) is a shot by shot remake of Half-Wits Holiday (Moe, Larry, Curly) — which, in turn, was a remake of Hoi Polloi (Moe, Larry, Curly). The basic plot in all three remains the same: the Three Stooges are inept workers, who become the object of a bet between two professors on whether nature or nurture define a person. Professor Quackenbush (Milton Frome) tries to train the Stooges into becoming gentlemen, with the aid of his beautiful daughter Lulu (Greta Thyssen) – a stressful process. The professor and Lulu try teaching the Stooges to read, learn mathematics, and the rudiments of table manners — by having them eat an imaginary meal. This last effort backfires massively, as the Three Stooges imagination goes into overdrive, complete with the sound effects of eating. It’s a funny bit, and gives Emil Sitka a chance as Sappington the butler to be the exasperated, stuffy butler who the Three Stooges walk all over – literally! 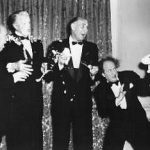 Eventually, the Three Stooges are given the opportunity to prove themselves at a society party, which begins well … and quickly goes downhill, first with Joe kissing a rich woman’s hand and trying to steal the diamond off her finger ring. This leads Moe and Larry to pull him aside, only to find out that he’s been stealing silverware as well. Despite Moe’s threats, Joe steals a pie from Emil Sitka/Sappington, which Moe tries to get rid of before they can be found out. This leads to stock footage featuring Symona Boniface, recreating her role as the socialite who gets accidentally pied in the face by Moe, after commenting on the sword of Damocles. That first pie leads into a massive pie fight, ending with the professor who thought he’d won the bet actually losing. The new footage was shot in two days. Prof. Quackenbush: Hey, you, with the mattresshead. If I gave you a dollar, and your father gave you a dollar – how many dollars would you have? Prof. Sedlitz: You don’t know your arithmetic. Larry: You don’t know my father.